It was an incredibly difficult day, one which saw the pros walking up a 27% grade nearing the finish. Michele Acquarone was tweeting, "...it was too much. We lost the right balance." Adding to the suffering was more of the same nasty weather that has accompanied Tirreno-Adriatico this year. Fifty two riders abandoned today. The result: Vincenzo Nibali is the new race leader. Taylor Phinney: "Probably the most trying day I've ever had on a bike. When I wanted to stop, I thought about my Dad and I didn't quit. I made it, 37min down". Phinney was the only rider that continued on despite that his effort would see his arrival at the finish outside the time limit (there is a fan sentiment that for his efforts he should be allowed to be allowed to race the final stage tomorrow). Peter Sagan: "It was a very hard stage. When the rain started to fall, the gradients of 30% were hard to get up. I heard Contador say that, when he climbed out of the saddle, his back wheel slipped. I rode in the saddle all the time." Fabian Cancellara: "I have just to say today's stage has nothing to do with bike racing." Chris Froome: "That was really hard. As soon as the weather came down, the conditions got even harder. I just didn't have the legs in the final. I felt I was a little over-geared and I don't think I was dressed warmly enough for the weather." Tomorrow: final stage, 9.2 km individual time trial, in which Vincenzo Nibali will hope to repeat last year's race victory. 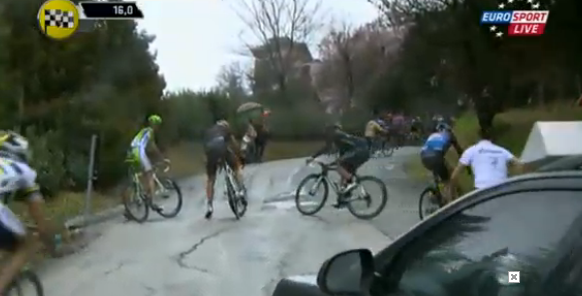 Is The Prato di Tivo a king stage of Tirreno-Adriatico? Are you sure? This way what is this STAGE (№6)? Yes this one is THE HELL, but this...also is the core of cycling,the diamond. Great Tirreno-Adriatico with great stages - one next is more beaty than previous... One thing to Michelle Acquarone - will do more clearning (for understanding) parofile maps for stages like this - will not questions in this case. Let will make adding profiles pictures of special places (30% e.t.c.). Just my spectacular view - before stage (viewing profile map) I think that this one is something suitable for hilly sprinters (like Pozzato, Paoulini e.t.c.) - but this one will hard nut even for Contador e.t.c. Anyway - GREAT RACE with GREAT STAGES. Kirill. Russia. This is what we get for not letting them dope. Great racing! And Nibali really didn't win the race on the climb, but rather on the descent with his skill and bravery. BRAVO ENZO! Doped or not, all the big stars looked like mortals on this stage. Don't give in to the whiners RCS, pro cycling needs epics like this to revive interest after so many doping scandals and boring races won by teams using "marginal gains".